Also coming in ESO: Elsweyr, the game’s first new class since 2017’s Morrowind Chapter — the highly anticipated Necromancer. With this dark, mysterious Class, players will command the dead and cast powerful elemental spells to overcome foes and bolster defenses. With the Necromancer, death itself is a weapon. As always, The Elder Scrolls Online’s unique Chapter structure and level-scaling mean that new content is easily — and instantly — accessible for both new and veteran players. Both level one and max-level fans will find challenges in Elsweyr that they can play side-by-side, exploring and conquering the new zone and stories together. The Elder Scrolls Online: Elsweyr can be pre-ordered for PC, PlayStation 4, and Xbox One now. The expansion is set to be released on June 4th, with early access available beginning on May 20th for PC/Mac players who pre-order. Pre-purchase The Elder Scrolls Online: Elsweyr now to gain immediate access to the otherworldly Rahd-m’Athra Mount, the base Elder Scrolls Online game, the Morrowind and Summerset Chapters, plus get the Noble Clan-Chief costume, Blue Dragon Imp pet, Baandari Peddler Crate, and more when Elsweyr launches. 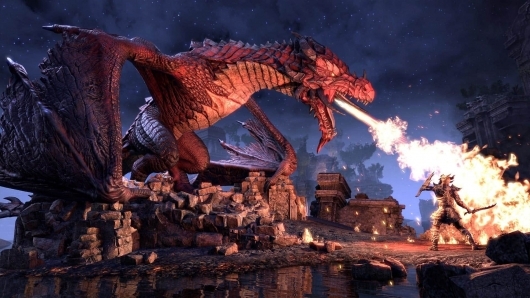 The Elder Scrolls Online: Elsweyr will be available on Xbox One and PlayStation 4 on June 4, 2019, with PC/Mac early access starting May 20.